Bentos definitely don't have to be complicated. For the most part, ours are not. It's just a matter of having a few of the right tools and a sandwich cutter or two is a must-have for your kitchen. A pack of cute food picks helps too, and your lunch is much cuter with just 5 seconds of extra thought! 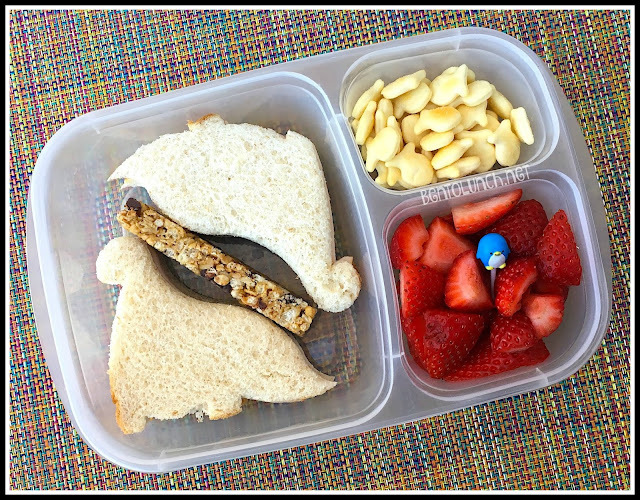 In this lunch, the boy took a turkey and muenster cheese sandwich on honey-wheat bread. I would have cut the sandwich in half anyhow, so pressing it with the dinosaur cutter wasn't much of a different. In between the two dinosaur halves, I added a granola bar. To the right, I used a cute penguin pick on strawberries. Again, it's just a simple add that makes the lunch a little bit cuter. I preslice strawberries when I buy them, so they're already ready for lunches. Above those are some parmesan goldfish crackers. He also took (not pictured) yogurt and an applesauce pouch.